One day in 1999 when his two-year-old son Lei Da went missing, Anhui farmer Lei Zekuan (Andy Lau 刘德华) begins his fifteen-year-long journey of hardship searching for his lost son. 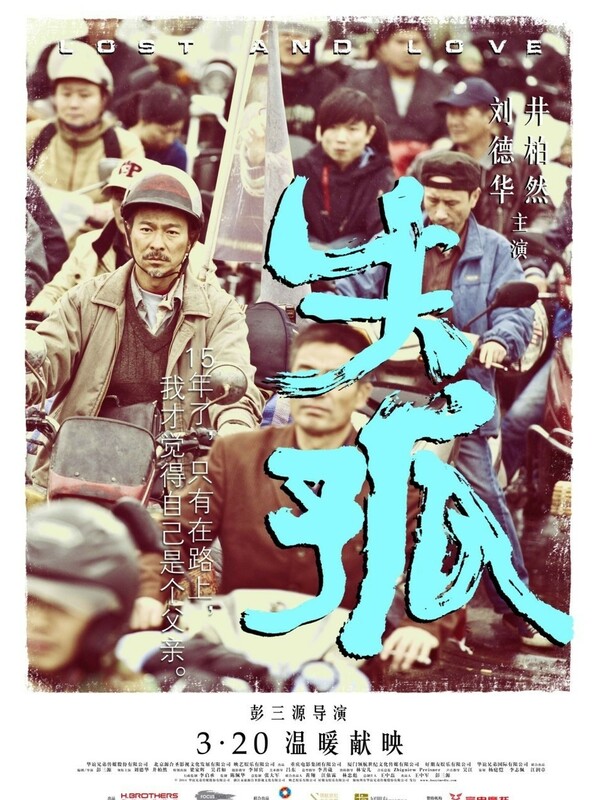 On his way he meets Zeng Shuai (Jing Boran 井柏然), a young car mechanic who was abducted as a child himself and is also searching for his parents. Lost and Love is a film interweaving three separate actual abduction cases into one movie. While the topic was similar to Vicki Zhao’s Dearest, I felt a little disappointed after watching the film. While all the actors did a great job, somehow, the film did not manage to touch my heart the way I thought it would. There were a lot of spaces and gaps, questions left unanswered…which I realised why so after watching the interview videos. Andy Lau played the character Lei Zekuan, a seemingly-stoic character who just move from one place to another, in search for his son, who had been missing for 16 years. I was unable to feel for him initially, until I realised that he was numbing his pain and only by moving from one place to another, can he feel that he was living. Just like his famous sentence, “Only when I’m on the road, I feel like a dad.” Here, you can’t see the super star Andy Lau, only a dad trying to keep moving and searching for hope. The times the two characters were interacting with one another, was perhaps the best moments in the film. They were amusing and heart-warming. It was so good, that you would think they could simply just move together like that, helping one another, forever. While I was disappointed by the lack of a happy ending for Lei Zekuan, I see how this film represent hope for parents, as well as how the audience see that they can do a part by reposting images of missing children, and keeping a lookout when they were travelling. Lei Zekuan, the role Andy Lau took up was adapted from real life dad Guo Gang Tang (郭刚堂) who searched for his missing son for 18 years. While he did not managed to find his son, he helped 7 families reunite with their kids. Jing Boran suffered a third degree burn during one of his motorbike scene. He fell off the bike while filming on a slippery road and the whole bike and engine was pressing on his leg. He was carrying Andy Lau’s double at that time. In order not to delay the filming process, he continued despite the pain. After seeing his burn, Andy Lau joked how he should just get a new leg! Andy Lau warned the director of the consequences of working with him as most of the scenes were outdoor scenes. On the first day of filming, the scene was filled with fans, some were on trees, trying to catch a glimpse of Andy Lau and nothing could be done. In the end, for every single scene, everything, including the entrance and ‘escape route’ had to be planned the day before filming. There were many incidents that happened because of Andy Lau’s popularity. In Chongqing, a female reporter was injured while running away from crew members who discovered her secretly photographing them. Another incident occurred on 17 May during the shoot in Chengdu where crew member quarreled with a female onlooker. The crew member was seen pushing the onlooker to the floor and struggling with her. Afterwards, Lau, who witnessed everything, was seen scolding the crew member for his mistakes. The scene done at the train station where Andy Lau was pasting “Lost and Found” papers was don’t with no real actors besides him. There were real passer-bys who enquired about the lost boy and did not recognize Andy Lau at all. He was even chased by the police for pasting the papers. Tony Leung (梁家辉) did a cameo in this film. He acted as a traffic police who stopped Andy Lau for going against the traffic rules but pitied him and helped him when he knew his purpose. This role was taken up by Tony Leung by pure coincidence. As the filming was under tight schedule, if the actors cannot make it within that date or time, the role will be gone. Andy Lau gave Tony Leung several dates for the roles available and Tony picked the date when they were filming this scene, hence the role of the traffic police. There were audience who feedback about how the story was not as touching as they thought and were disappointed by the lack of scenes where Andy Lau lost his child. Andy Lau replied by saying how he did not want parents who lost their child in real life to cry after watching, what he need was to have other people helping them after watching this film. Check out Lost and Love (失孤) Hua Lien Media’s Facebook Page! Lost and Love (失孤) is out in cinemas on 26th March 2015. I think I will skip this movie, well apart from Andy Lau & Sandra Ng I am not keen on this kind of story line. Looking forward for more exciting movies this summer. Really occurred to me this is a good watch. I wish this is gonna be available on big screens here. Too bad it didn’t meet some of your emotional expectations. It looks like a good story though with some real heavy moments. I will definitely well up on this one. I’d love to see this movie. Ouch on that burn! He was trying too impress you, Tiffany, yet the movie did not touch your heart. I am kidding. Sometimes, we expect too much from a film especially when it stars an effective actor. Andy Lau is a fine actor though i haven’t watched his movie from a long time now and this seems like an emotional drama. Oh wow, what an emotional plot! This reminds me of a Filipino Indie film, albeit, a different storyline, but same scenario – a father searching for years for his long lost son. It felt powerful to me. I bet I’ll cry in this one if I get to watch this. I read the movie synopsis and I think Andy Lau have the talent and skills to portray this role. I”l watch this movie online, if I could manage my time this weekend. Not really familiar with the actors in this film, I usually am drawn to movies with familiar faces unless it’s fantasy and action-packed. I think I might just cry when I watch it, being a mom, the story about losing a child is more heart-breaking for us parents. Just the thought of losing mine freaks me out. Will pass on this one. Love your honest review. I felt a little disappointed after watching the film. While all the actors did a great job, somehow, the film did not manage to touch my heart the way I thought it would. So does it implies that the film luck continuity or just there is little heartfelt scenes. Nevertheless, for those who love drama film then this is one a good one to watch. This seems an interesting movie. Although it would’ve been nice if it ended happier for Lei Zekuan, I can understand how sometimes, in life, we don’t get the happy ending we expect. Anyhow, I’d love to watch this movie just to see Andy Lau’s acting. I usually feel moved even with stoic characters. It’s the subtlety or absence of intense emotions that sometimes get to me. ‘Cause a lot of people I know (even me) are like that. You barely notice they’re suffering… But they are. Sounds like a great movie, despite there being unanswered questions – so many films and tv shows made on this though that I expect it is difficult to think of a new slant. Shame about Jing Boran burning his leg!